A KAIST research group presented photonic capsules for injectable laser resonators using microfluidic technology. The capsule's diameter is comparable to a human hair and stable in gas and liquid media, so it is injectable into any target volume. The research group headed by Professor Shin-Hyun Kim in the Department of Chemical and Biomolecular Engineering applied an interesting optical property from nature. Professor Kim, who has dived deep into photonic materials research inspired from nature such as the Morpho butterfly, used a trait of beetles this time. 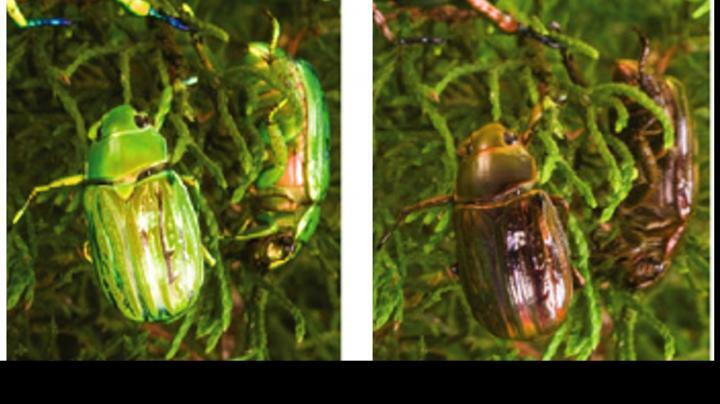 Chrysina gloriosa, commonly known as the glorious beetle, shows a green color similar to leaves when illuminated by left-handed, circularly-polarized light while showing no color with right-handed, circularly-polarized light. This unique optical feature helps the beetles communicate with each other and protects them from predators. The principle behind this interesting optical property of the beetles relies on helical nanostructures with left-handedness that are present on the shell of the beetles. The helical structures reflect a circularly-polarized light with the same handedness of the helix at the wavelength selected by the helical pitch through optical interference. Such helical nanostructures can be artificially created using liquid crystals (LCs). LCs with a helical arrangement are referred to as cholesteric LCs (CLCs). The CLCs exhibit the polarization-dependent reflection of light in the same manner as the beetles and have been used for various photonic applications. In particular, CLCs have been cast to a film format that serves as mirrorless laser resonators, unlike conventional lasing systems. However, the film-type CLCs are large in size and show unidirectional emission, which restricts the use of CLC resonators in microenvironments. To overcome these limitations, Professor Kim's group has encapsulated the CLCs with dual shells using microfluidic technology. The inner shell is a water layer that promotes the alignment of LC molecules and the outer shell is an elastic polymer layer that secures capsule stability and enables reversible mechanical deformation. The spherical symmetry of the capsules enables omnidirectional laser emissions. Moreover, laser intensity and lasing direction can be further controlled by deforming the capsules, while its wavelength remains tunable. This new type of CLC laser resonator is promising for laser treatments in various biomedical applications. Professor Kim said, "The helical nanostructure used in the laser resonator resembles that of the shell of chrysina gloriosa. Humans learn from nature and engineer materials to create something unprecedented." This research was led by graduate student Sang Seok Lee and an article entitled "Wavelength-tunable and shape-reconfigurable photonic capsule resonators containing cholesteric liquid crystals" was published online on June 22, 2018 in Science Advances.